We're always on such a high after our events. Our most recent Night of Board Gaming for Good on Top of the World, held on March 2nd, was another one for the books! Thanks to you, our sponsors, volunteers and everyone who helped make it possible, we've managed to break another record! FTW Events' officers and volunteers present a check to Danny and Jennifer Kramer from the Imagine Guild. 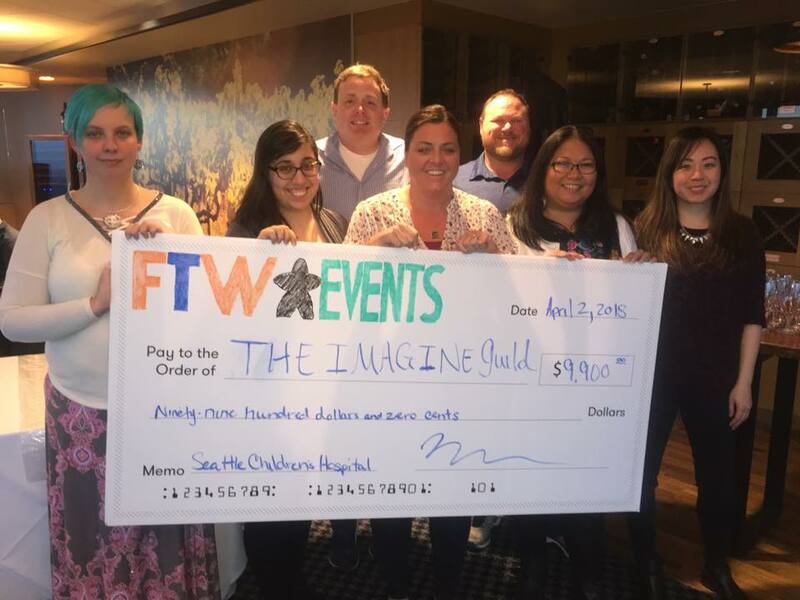 Yesterday at our April Game Night at the Tower some of our officers and volunteers presented this awesome and comically huge check to Danny and Jennifer Kramer, representatives and members of the Imagine Guild, to the tune of $9,900. 100% of the amount will go towards helping kids and their families at Seattle Children's Hospital. This blows away any previous record we've had for our Comic-Con events. And we couldn't have done it without you. Thank you so much. Let's do it again in the Fall, yes? :) See you there!